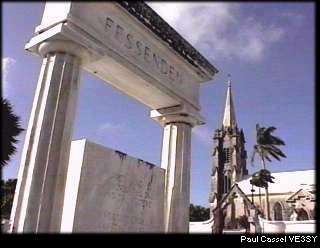 While recently on a business trip in Bermuda I recalled Fred Hammond VE3HC, mentioning that Bermuda was the final home and burial place of a famous Canadian, Reginald Fessenden. As it turned out the Hotel I am staying in is just a few steps from his home and the Whitney Institute at which he was Headmaster. 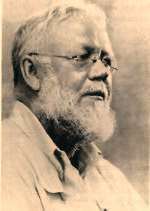 Fessenden had married a Trott (an old Bermuda family) and in his memory there are scholarships called the "Fessenden-Trott Scholarships". Tony, VP9HK informed me that two of his sons have been awarded this Scholarship. In speaking with Laurie VP9NMR I learned the location of his grave site and original homestead. It turned out his home was less than half a mile down the road that I was staying on and the church was a 5 minute scooter ride away on the other side of the island. It turned out that Laurie is originally from Hamilton Ontario and has lived in Bermuda since the late 50's. In 1876, when he was only 10 years old, Reginald watched Alexander Graham Bell demonstrate the telephone in his lab in Brantford, Ontario. Six days later, Bell made the first long distance phone call in history, from Paris, Ontario to Toronto, Ontario, a distance of 113 kilometres. From his home in Fergus, Ontario, Fessenden closely followed the work of Bell, and he never forgot his dream of transmitting words without wires. Few people shared Fessenden's belief that broadcasting voices was possible. When he asked the opinion of the great Thomas Edison, Edison replied, "Fezzie, what do you say are man's chances of jumping over the moon? I think one is as likely as the other." - - - Edison was wrong. It took six years for Fessenden to refine his invention but, on Christmas Eve 1906, Fessenden made the first radio broadcast in history. Radio operators on ships in the Atlantic were shocked to hear a human voice emitting from the equipment they used to receive Morse code. Many operators called their Captains to the radio room, where they heard Fessenden make a short speech, play a record, and give a rendition of "O Holy Night" on his violin. Discovering a way to broadcast human voice by radio is only one of Fessenden's accomplishments - during his life he came up with over 500 other inventions including the Fathometer or depth finder which are reflected in the words of the memorial above the vault of Fessenden's final resting place. Canadian Communications Foundation web site.